I thought it would be fitting to do a pattern review on one of my Sew Sew Saturday posts...click here for other Sew Sew Saturday posts. 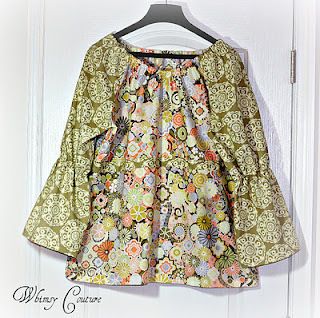 A few weeks ago, I received an email from Kayla from Whimsy Couture asking if I would be willing to do a pattern review. Absolutely!! The best part is the pattern is sent via email. I want everyone to know up front, I wasn't paid to do this review...I was just sent the pattern to use and write a post with my opinion. The pattern I chose was the Ladies Peasant Top. I'm going to be honest...I haven't sewn clothes for myself in a while and I've also never used a pattern that was sent to me from an email, so I was a little nervous. Isn't it so cute...same pattern for the Peasant Top in the following 3 pictures! My first thoughts were of the old style patterns you buy like Simplicity. You know, the tissue paper kind, where you lay out the patterns for the front, back and sleeves etc. I'm thinking how am I going to print all those pieces and then tape them together from an email. 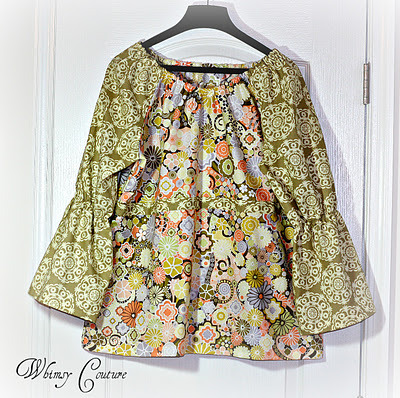 Well, NO worries with Whimsy Couture Patterns...holy mackerel they are BRILLIANT!!! and I'm not kidding. I've only worked with the Peasant Top pattern, but I can only assume all the other patterns are just as great. I literally just printed 3 pages with regular computer paper...2 extra if I wanted to tailor the shirt! Excellent sizing charts, fabric cutting charts and the instructions! This is the most AMAZING part...that's the patterns piece. That little white thing in the corner! It was fast, easy and definitely user friendly. Here is my daughter Kelsie modeling our version with a little fashionable belt. 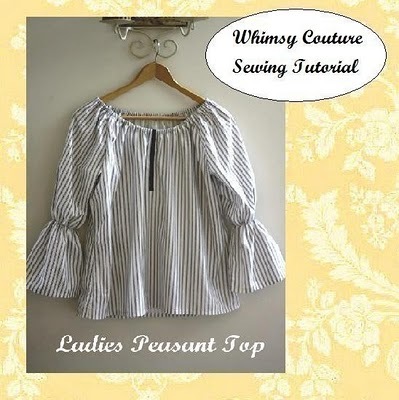 I would highly recommend Whimsy Couture for wonderful sewing patterns of all kinds. Here's the fun part for you... 50% off all patterns for Sew Many Ways readers and a Give Away for a package of 3 patterns!! WOO HOO!! Section 1...discount for all my readers. If you'd like to enter the give away, just leave a comment on this post. If you have a Facebook account, they would love it if your "liked" them!!! CLICK HERE to visit their Facebook page and give them lots of LOVE from Sew Many Ways! I will pick a winner next Saturday!! Thanks so much for stopping by. Have fun shopping and good luck with the give away!! I would love to make this! It is so cute and it looks easy too! I started my sewing life making clothes, and I'd like to get back to it. Thanks for the intro to Whimsey. That looks so simple! I would love to make some of these for summer,with short sleeves of course :) The site is very easy to navigate,and the patterns are all way cute! Would love to make my almost 2 year old great niece one of those T-shirt dresses! That is a very cute blouse! The pattern looks like it was a brilliant plan. I would love to try this out. I loved peasant blouses when I was a teenager, but hmmm would they still look good on me? Well I have a daughter too, but not sure she likes that style. I'm going to take a peek at the other patterns. Thanks for sharing your review. It's always reassuring to read someone else's experience with PDF patterns. (I was/am in the middle of making Wiksten's Tova Tunic and the Tank Top when I fell & broke my wrist! Their downloadable patterns are great too.) Now, I'm off to check out Whimsy. Thanks for the chance to win. So cute! And looks easy to make, too! I am so off to check out the whimsy patterns but would not mind winning some also!!!! Very sweet top! Thanks for a chance to win. That looks so cute on your daughter. I've been sewing some skirts and think I need to branch out and try a shirt. Thanks for the giveaway. Nice top. That pattern would be something for me, I have not sewn anything for myself in many, many years. Amazing that you only need three printed pages. Someone is very smart. Isn't it cool they asked you for a review? they know we are all over here reading your blog. I would love to win a pattern. In the meantime I'm off to look at all their patterns now. I just recently finished my very first sewing project and would love to do more, these patterns would be the perfect start! Thanks for the chance! I have not sewed garments in ages. But this pattern looks so cute and stylish. I gave up on the McCalls, Simplicity and Butterick patterns. They are just like they were years ago. Thanks for the review and giveaway. This looks nice......think I'll give them a try! but got into quilting the past few years. Maybe it's time to check clothes patterns out again. Thanks for the review and discount too. I also liked them on facebook. Sure do enjoy your blog alot! Wow Karen! This is amazing! I am definitely going to check this out - what fun it would be to sew clothes for myself and my teenage daughters - with such easy patterns, they would probably make their own clothes! Thanks for the link and for the discount, and of course the chance to win free patterns! Really cute top. I use to make all of my clothes and just am starting to make some tops again. Thanks for the chance to win some new patterns. I love the top. The pattern looks easy to follow. Love to win the giveaway. I like he short sleeve top, looks like a quick project. 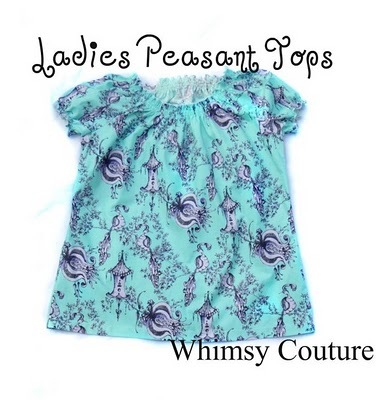 I love Whimsy Couture's peasant styles both for little girls and big! Thank you for the review, Karen. So cute. Looks like a great pattern. Great job! This looks like a pattern that my daughter would just love! I should love to get such an easy pattern! I used to sew clothes, before quilting, lol. Would be nice to try again. I would love to win a pattern. Very cute and yeah for having daughters home from college, right? Clever of them, they give you the "negative" pieces of the pattern to cut away??? That is what it looks like in the photo. I'm trying to change my image and going for more "girl shirts" instead of t shirts all the time. I've bought several patterns and am making a few. Love the look of this one. I'm headed over now! Such cute patterns - love the peasant top. I have not sewn any clothing in 27 years, but this pattern looks simple enough for me to tackle. I would certainly love to win a pattern. Thank you! Cute top and it looks very easy to make. Sort of like the bishop baby dresses. I would love the pattern for my 13yr old dgd. I think she would like it and it could inspire her to use the sewing machine I gave her. Cute top, and looks easy to sew. She had some other interesting patterns, too. Thanks for the chance to win some! Great job on the shirt. I love the fabric you chose. Your daughter is beautiful! What fun patterns, thanks for sharing your review...will check them out. Cute pattern and I love that it only took 3 sheets of paper! What a great way to do a pattern. Never thought to only have the pieces you cut out as the pattern. Saves paper which is always a good thing and the top looks great on your daughter! Awesome, I would love this pattern! Have been thinking about sewing clothing for myself for a while but haven't yet worked up the courage. This looked really straightforward so I might just be tempted to have a go. Thanks for the great review! I love making clothing. That is my favorite sewing of all. Thanks for the chance to win! I really like all the selections and they do not seem too difficult. I am a novice seamstress and am intimidated a little by sewing clothing. That really looks easy! I might dare to try! What a great top for crops or skirts in the summer. I love it with the belt! wow a pattern from an email. So very cool. I have been doing patterns the paper way since I was eight. You did wonderful on your peasant blouse. I'd love to try these patterns! These patterns look great! The way the pattern pieces are small intrigues me. Hugs and thanks for your great blog. So cute. I just inherited my mother's sewing machine a while back and recently dusted it off and gave it a place of prominence in my room. My new little sewing corner. I can't wait to get started by alas no patterns have jumped out at me. I LOVE this one. To win one would just be icing on the cake. Thanks for the review. I have liked their FB page and I look forward to jumping into sewing again (haven't sewn since I was a teenager living at home). What a great idea for making patterns similar. Something like this could get me back into making clothing again. Looks great, I used the code and ordered, thanks so much for the giveaway and a heads up for a lovely pattern company. That pattern does look very clever! I'd love to try it! I love the peasant blouse. The peasant top is one of my favorites to wear! The pattern pieces intrigue me and I wouldlove to win a pattern. What a different concept in sewing patterns. Thanks for a great review!